Did I say my swatch was going to be a quick one? Ah how optimistic. Actually swatching generally is fairly quick when you’re working with bulky weight yarn, but I do kid myself to think I’ll just get away with one. 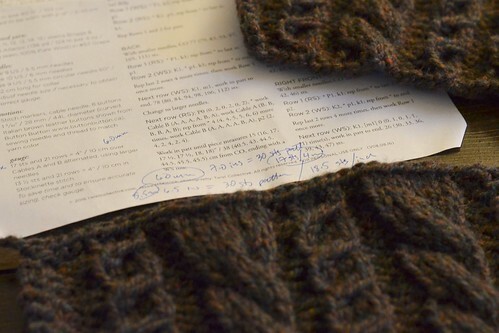 We do this thing to ourselves in knitting world where we include gauge references in written patterns even if it’s not a stitch gauge that’s actively used in the pattern. I do this too when I write patterns, and I see it everywhere in knitting patterns, and I know there must be a reason for it even if it escapes me at this present moment: Even if the pattern uses an all-over stitch pattern in cables or lace, we still also refer to a plain stockinette gauge in the pattern. Deep down I’m sure the real usefulness of this system is that if you already know what needle size you would use to get the indicated stockinette gauge, you could just go straight to knitting the stitch pattern swatch with that needle size and skip the stockinette one. Me, I’m starting Smoky Lake with a yarn I’ve never knitted with before (though admired at a glance), so I don’t have a point of reference for either one. So how do you swatch? Well, I do both just to be on the safe side, but really I probably could go directly to the cable stitch swatches and call it a day. This pattern is really dominated by the cable gauge. I suppose I think I’m shoring up good karma by doing both, though. Smoky Lake calls to me, therefore I must be sure that I’m knitting the size that I intend to knit. 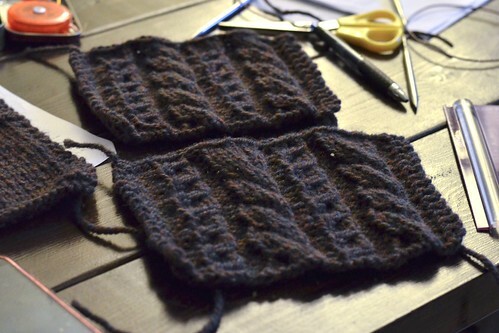 First I knitted up a large stockinette swatch where I changed needle sizes halfway through – two gauge swatches in one! In this case I got the indicated stockinette gauge on a needle one size smaller than the pattern indicated. Second, I knitted a cable swatch using the needle that I got the stockinette gauge with. To take a gauge reading on this (because cables can be messier) I measured how many inches it took to get 2 full pattern repeats of both cables, then divided how many stitches there were in that number of inches (to get pattern sts/inch), then multiplied THAT number by 4, to get my cable pattern gauge. 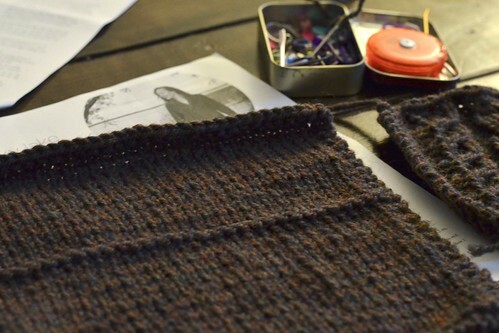 Naturally, the first swatch turned out more snug than the pattern calls for (I got 18.5 sts/4 ins instead of 17. ). So, I swatched a second time, and lo and behold got the pattern gauge, as called for in the notes, on the same needle size as called for in the notes. Knitting sure is a fun adventure, am I right? (Also check out the size differential on those swatches. Gauge makes a big difference even if it’s just 1.5 sts over 4 inches! Especially on bulky yarn). Thanks little swatches, you’ve been a treat. Hi, I’ve been enjoying your blog for a while now. I do have a question regarding the way patterns are written and swatching. Does the recommended amount of yarn needed as stated in the written pattern usually include enough to knit swatches? Or do you recommend purchasing extra yarn so ensure there is enough after swatching? Thanks in advance. Ha! I thought this was Briggs & Little! I’m getting to swatch the Little Waves cardigan and was dreading the entire process. Thanks for sharing your process & what you learned. cast on to determine the number of stitches that produced the cable pattern swatch, yes? pattern. At least it is for me. Wow. That photo of your swatches is the best argument I’ve ever seen for being diligent about swatching. Thank you. Beautiful yarn. Does it really have a blue cast to it or is that a trick of light? You’re very welcome! The yarn is really a true brown heather, so the blue-ish-ness is just a trick of the light 😉 I would recommend it though, if you like heathery wool! I was never a fan of swatching. Still can’t say I’m a fan, but as this story demonstrates it’s such an important step. There’d be nothing like spending all the time to knit a sweater to find it too large/small. We’ve all seen those pictures. Why I swatch: so i can put the swatch in my purse and have a whole big piece when i am looking for buttons. So I can look for a shirt to match husbands birthday sweater, discovering that under fluorescent light of the store that it reads as a different color, and thereby changing my choices entirely. So I will know for sure if the blocked swatch will hold its shape and size with hard wear, or whether all those cables will just scrunch back up. Receiving compliment about said swatch from the helpful sales associate. Plus all the other reasons as well.